With the summer matsuri (festival) season about to begin the first thing we needed were yukatas (cotton kimonos) for the kiddos. Now whenever we head out to a bon odori or go hanabi viewing, I know exactly what they will wear. They love lounging in their comfortable duds. When a friend recently requested this recipe after her husband had a taste of DaddyO's lunch, my first thing to do was look online so I could send her the link. To my surprise not only was this recipe not online but I couldn't find anything even close to it. Since I had to type it up for her I thought I might as well post it here in case I ever should lose our paper copy. This is not your average fattening fried gooey cashew chicken recipe that you would get at your local Chinese take out. This non-Americanized recipe consists of tender marinated chicken with a light flavorful sauce, mixed together with bell pepper, onion and cashews. It's healthier but still has a fantastic flavor. I usually serve this over rice and it is even better the next day (or two). Pat the chicken meat dry with paper towels and then marinate with the rice wind and corn starch for 15 minutes. We put the marinade and chicken in a Ziploc bag and get most of the air out. While the chicken is marinating start some white rice. Heat up a large skillet with 1 tablespoon of cooking oil and stir-fry the chicken meat until the color turns white or half-cooked. Dish out into a bowl and set aside. Add another 1 tablespoon of cooking oil into the skillet and add in the powdered ginger, bell pepper and onion. Stir-fry for five minutes and add the chicken meat back in. Add in the cashews and stir everything together. Add in the sauce and stir continuously until the chicken meat is cooked. Add salt to taste, and serve the cashew chicken over white rice. For a family meal you will need to double this recipe. With our weight slowly creeping higher and higher with each move I have become very selective of the books I keep on our shelves. We cleared out quite a few before our trip overseas and DaddyO wants to keep the book weight down on our return. 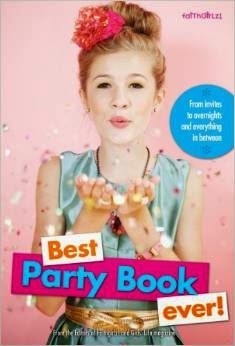 That being said, I had no problem adding the "Best Party Book ever" to my entertaining collection. There is nothing EJ and I like more than a reason to get some friends together, and this book gave us plenty of ideas. The book is geared to the teenage girl but we still had fun flipping through the pages. From Cookie Bake Offs to a Christmas Cardi Party, there is a wide range of ideas. My favorite is the Secret Garden Tea Party; one I would love to do for EJ and her friends. The book gives instructions on setting the scene, invite inspiration, color scheme, and decor dreams. It also gives recipe ideas and suggests some crafts to do with the guests. The pictures are fresh and updated. They remind me of something Martha Stewart Kids would have produced. I am excited to have this book sitting on my shelf ready to provide some inspiration when needed. Thomas Nelson provided a free copy of this book in exchange for my review which I freely give. A little road repair can bring quite a bit of excitement. We watched from up top for a little and then headed downstairs with chairs and hung out on the side. The Japanese workers were confused at first as to why they had an audience but then seemed to enjoy the attention. The kiddos learned how some big construction equipment worked. Saturdays are usually our excursion days. If I'm caught up with the housework then I go along. If not, then it's just DaddyO and the kids on an adventure. Fortunately I forgot the house cleaning on this particular Saturday and we did an early morning drive to the beach. Enoshima beach is just over 10 km south of us but it took us close to an hour to reach. We had breakfast at a McDonalds along the beach. It's always fun to find the difference in food. This time we had an egg mcmuffin with spaghetti sauce, and another with tuna salad. Our original plan was to visit the Enoshima Aquarium but we didn't make it in time for the 1,200 yen parking so we continued on to Enoshima Island. Parking was easy to find as we went over the bridge and since it was a municipal lot we paid only 420Y/hour. The views from the parking deck were beautiful. We could hear taiko drums in the distance and were treated to a parade as we walked to the beach. Little did we know what was in store for on in a little while on the beach. The kids played in the sand and water. There was no shortage of people wanting to hold Baby B and take photos of the kiddos. We then realized that the number of people gather on the beach was not normal. Down the steps came men in loin clothe carrying a shrine. They danced and bobbed as they carried it toward the ocean. Then they continued into the ocean. Swam around a little and then came back to the beach. I later found out this march was part of Enoshima's Tenno Festival. You never know what you'll see in Japan. After the excitement on the beach we headed to the main road for a seafood lunch.